In my recent post about the importance of AdWords certification for digital marketing students, I referenced a Google Hangout with the GOMC team. In this Hangout, I shared how the Google AdWords Certification exam is a new course requirement in MKTG 477. The AdWords Professional Certification Exam: To earn the certification, you need a passing score on two exams: the AdWords Fundamentals Exam and one other advertising exam (the Search Advertising Exam is recommended). To earn credit for my class, send me your certification URL via email before the due dates listed below. You can earn more points by passing the exam earlier in the semester rather than later. I am pleased to report that 100% of my students passed the Google Certification Exam by March 1. 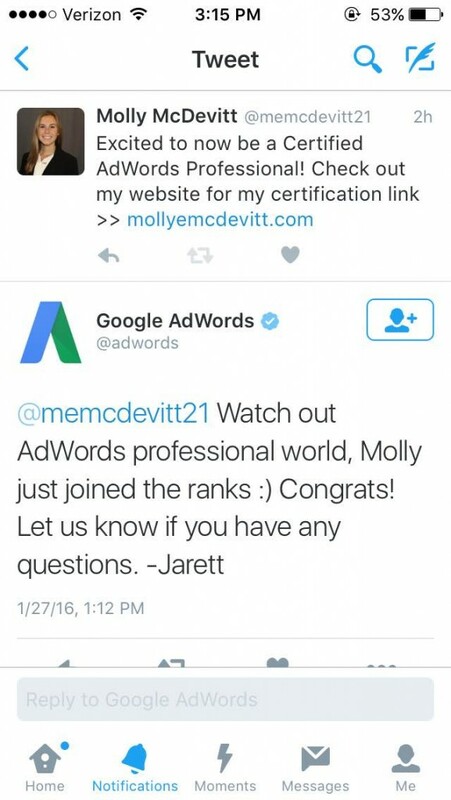 I loved this tweet from @AdWords after Molly McDevitt shared her professional credential in Twitter. 1 Comment on "AdWords Certifications from the JMU GOMC Class of 2016"